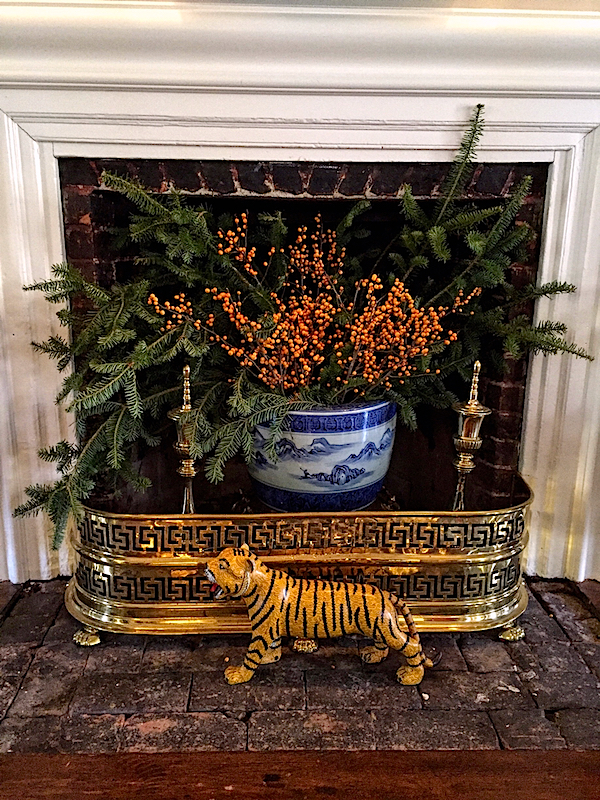 My friend, designer Lisa Hilderbrand, lives in a renovated 18th century saltbox that each year she transforms into the epitome of Christmas in Connecticut. 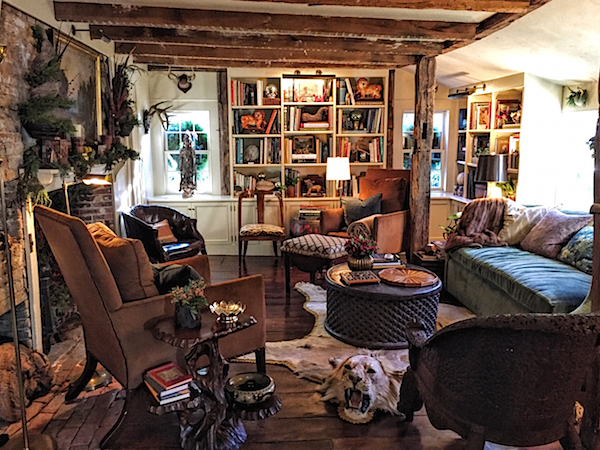 Having purchased the house in 2004, Lisa and her husband fell hard for the spacious antique in a historic part of New Canaan. With seven fireplaces, seven bedrooms, sleeping porches and a ballroom, it had potential, but was a fixer upper with major challenges, from broken windows to leaky roof. But they were up to the task, and despite a major fire in 2005 during the final stages of renovation, the house was finished and this year the work effected by the Hilderbrands and their architect/contractor, Robert Chipley, received the President’s Award for Preservation from the New Canaan Preservation Alliance in 2015. While the exterior still retains an antique feel, double doors were added for a more gracious entry. 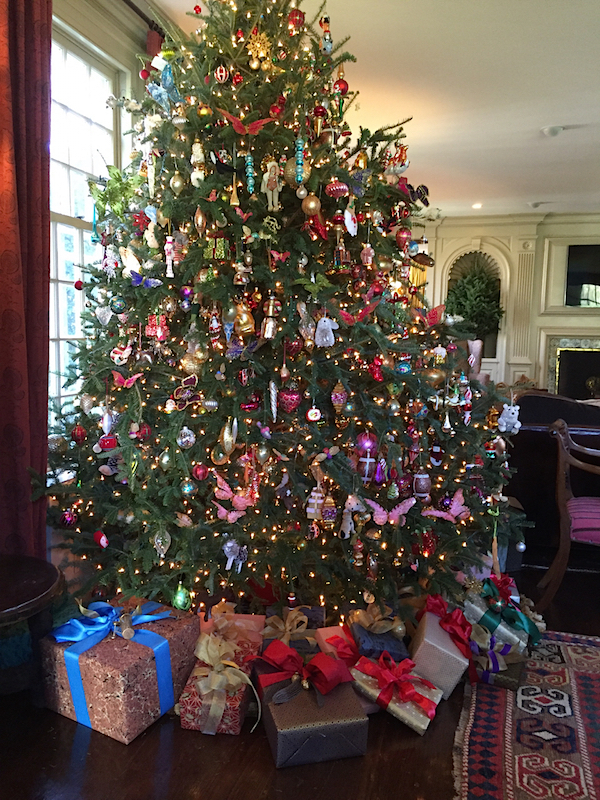 Several weeks ago, I visited Lisa’s home during the Newcomers Club of New Canaan‘s Homes for the Holidays House Tour. 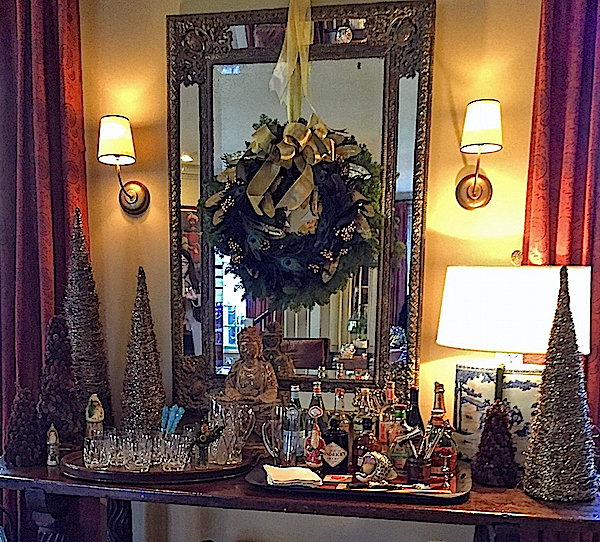 Lisa’s father passed a way several years ago but she carries on his passion for holiday decorating. 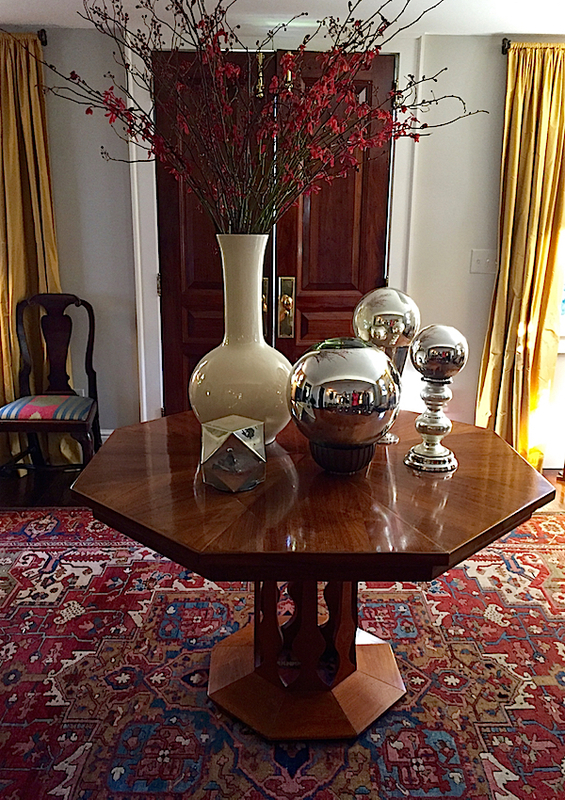 For her entry hall, she keeps her eye out for vintage mercury glass balls and other interesting decorative objects that add special holiday appeal. 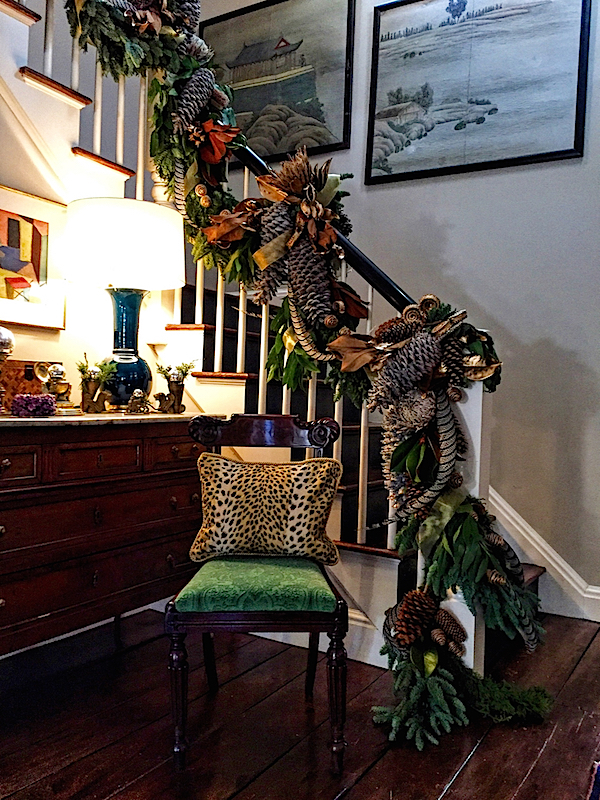 She mixes fresh greens with store finds, like the Pier 1 giant glittered pinecones, for a lush festive garland up the stairs. Their large living room, the ballroom in the original house is an enormous 20′ x 40′ space. Able to accommodate a towering 11 foot Christmas tree, Lisa follows her father’s advice of cutting a foot off the top and bottom to enhance the illusion of an ever larger and fuller tree. Tree decorating tip 101 – “Tuck lights all the way in to the base of the tree, then hang shiny balls far inside so they reflect and multiply the light.” Every surface reflects the holiday. 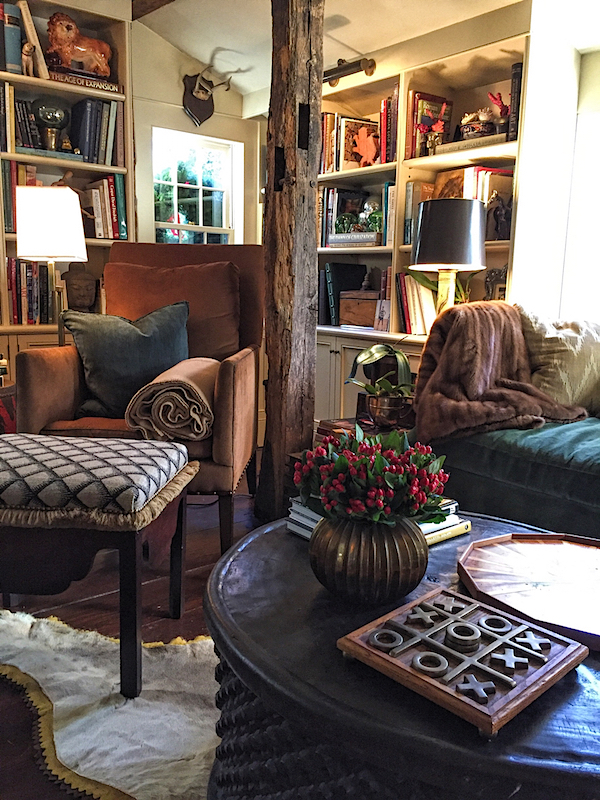 At the other end of the room, an antique library table mixes in subtle holiday touches amongst Lisa’s collections. Her days working at Christie’s helped educate her eye for unusual and unique decorative accessories. 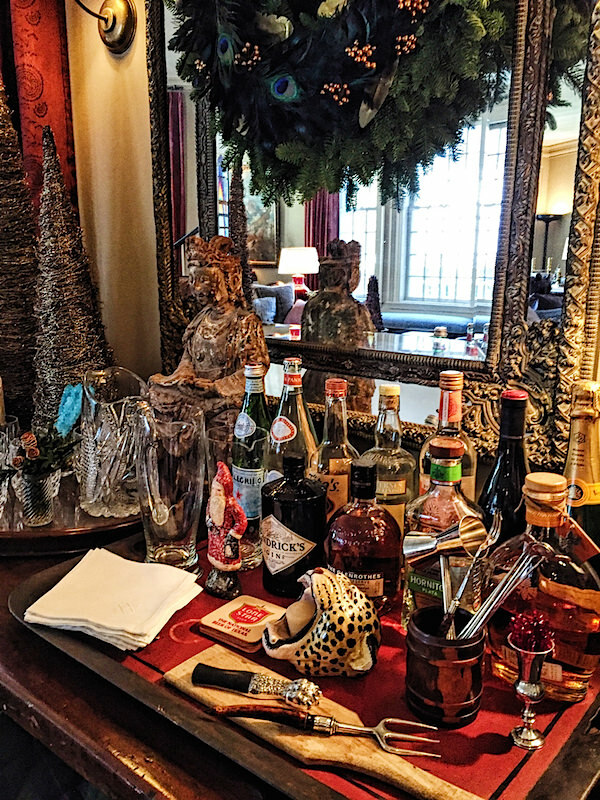 A festive bar is every ready for guests. Lisa has collected vintage barware over the years that she also recommends as great gifts – from silver bottle openers and jiggers to cocktail forks and coasters. Monogrammed cocktail napkins add a personal elegant touch. 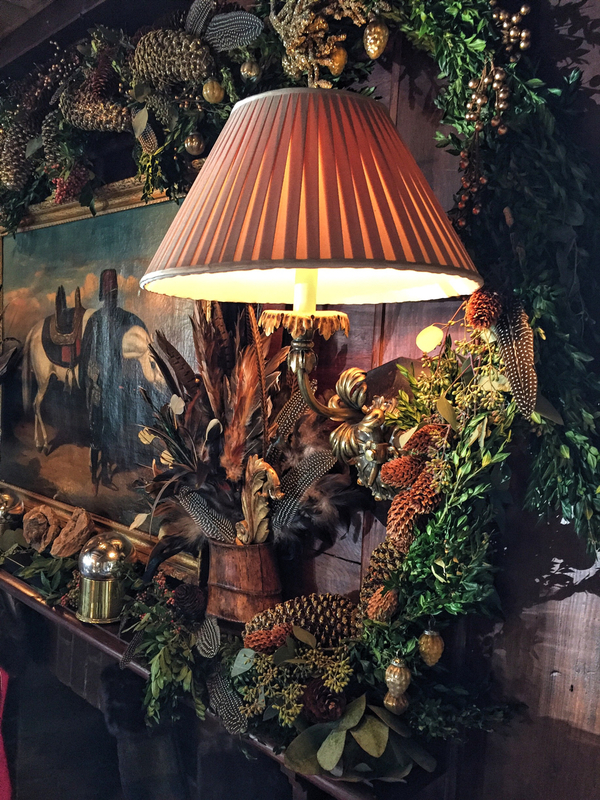 The dining room seems right out of a movie set for a modern version of Christmas in Connecticut. 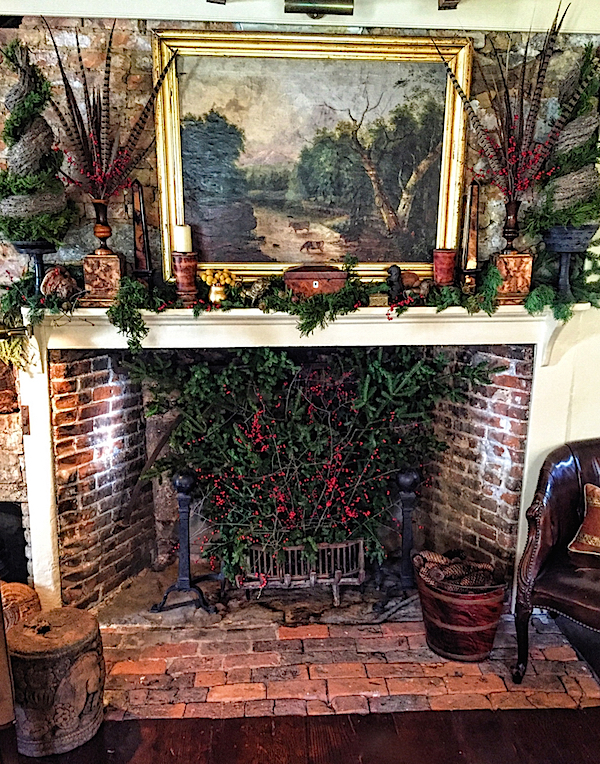 With its original early nineteenth century paneling and ceiling beams, it is a cozy room perfect for holiday entertaining. 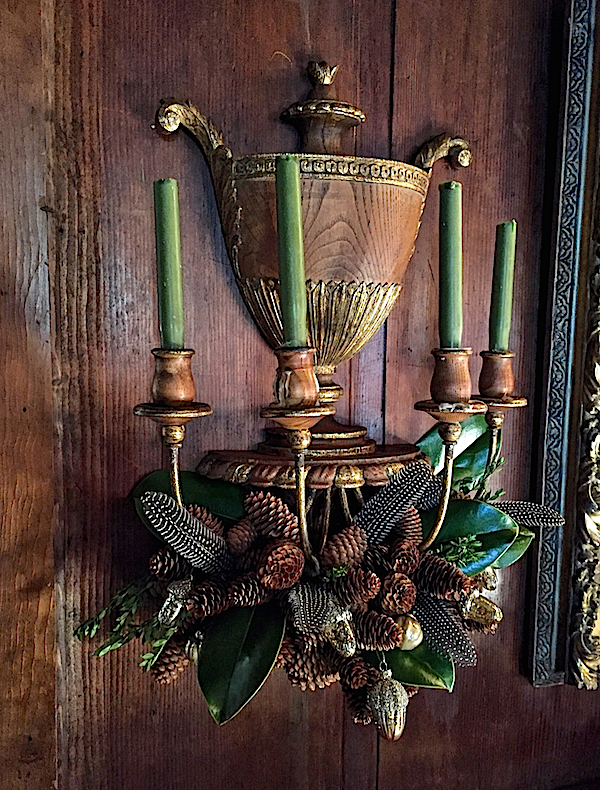 as well as the antique sconces from John Rosselli. 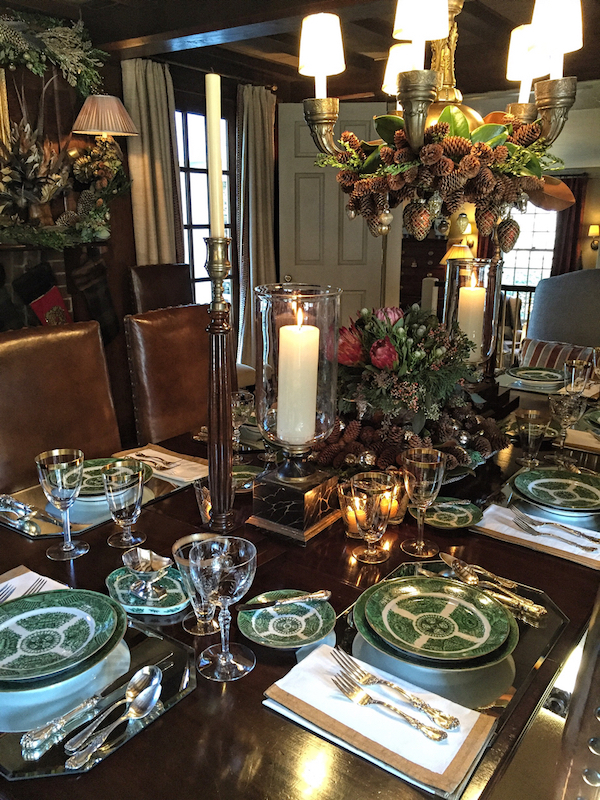 Antique Fitzhugh china is surrounded by the glittering reflection of many tiny votive candles and mirror placemats, which Lisa suggests looking for on wedding websites. 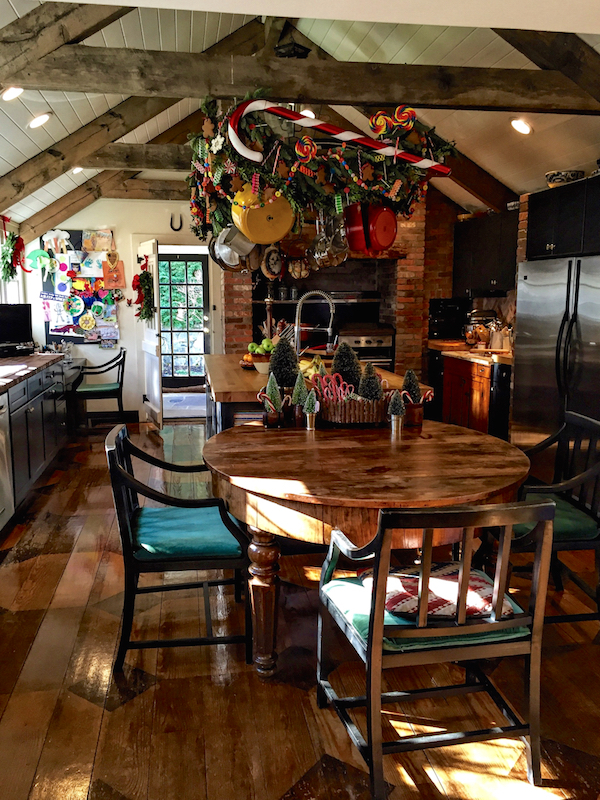 The country kitchen is the site for many holiday crafts and baking activities with the kids. Lisa always decorates the pot rack and this year’s theme was candy. Everything is real except the giant candy canes. Beyond the living room is an original outdoor pavilion. 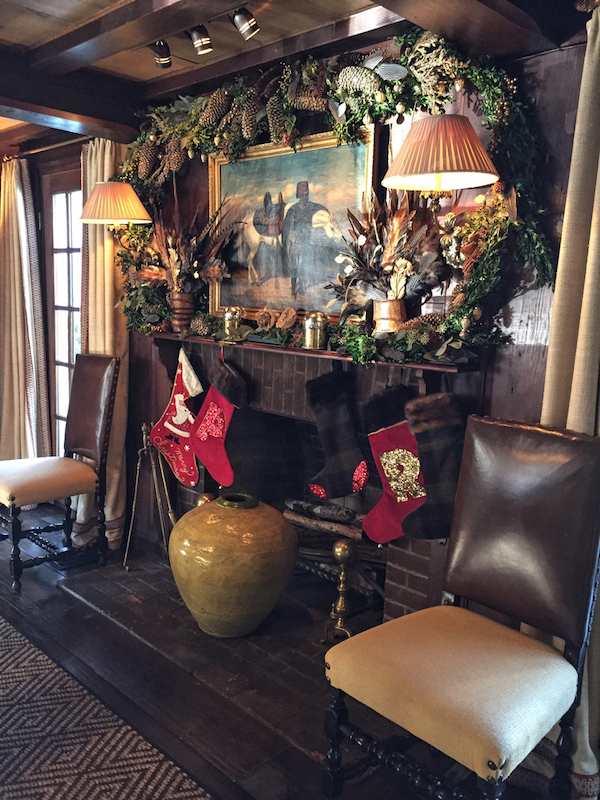 The Hilderbrands added the fireplace to extend the seasonality of the space. I’m sure it’s getting lots of use this year with the mild weather. Thank you Lisa for inviting us into your beautiful home. 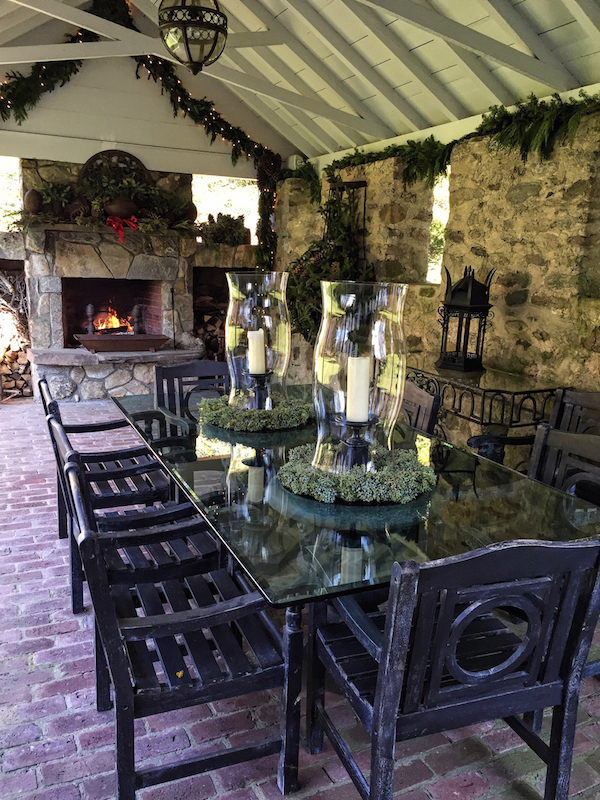 It is indeed the perfect setting for a wonderful Christmas in Connecticut. This entry posted in architecture, holiday, interior design. 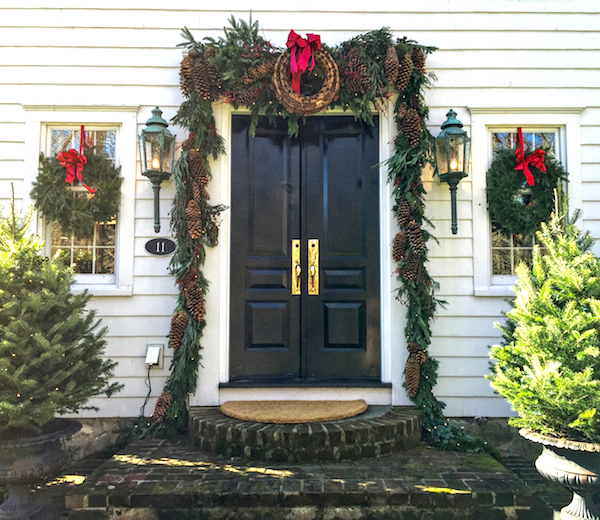 Entry Tags: antique houses, Christmas, Christmas decorating, Holidays, house tour, interior design Bookmark the permalink. 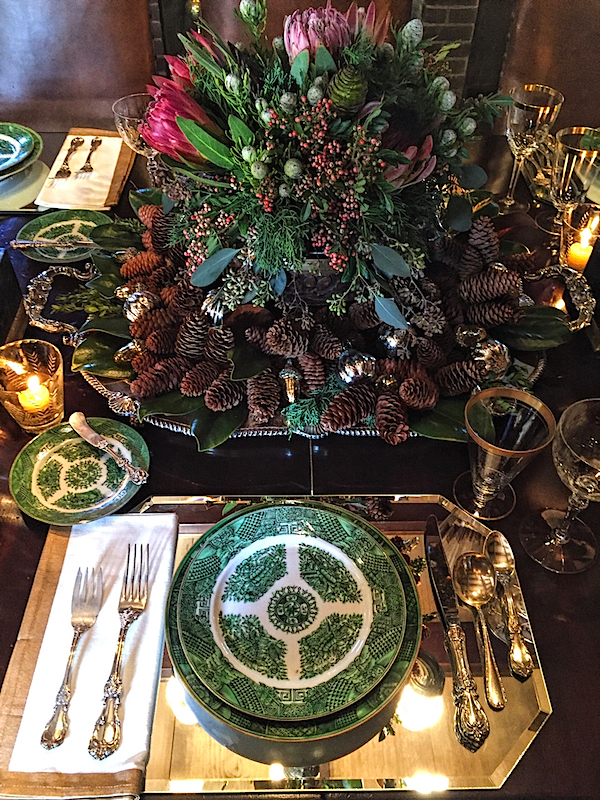 I love the pinecone, feather and greens mix — a fresh new take for the holidays!! 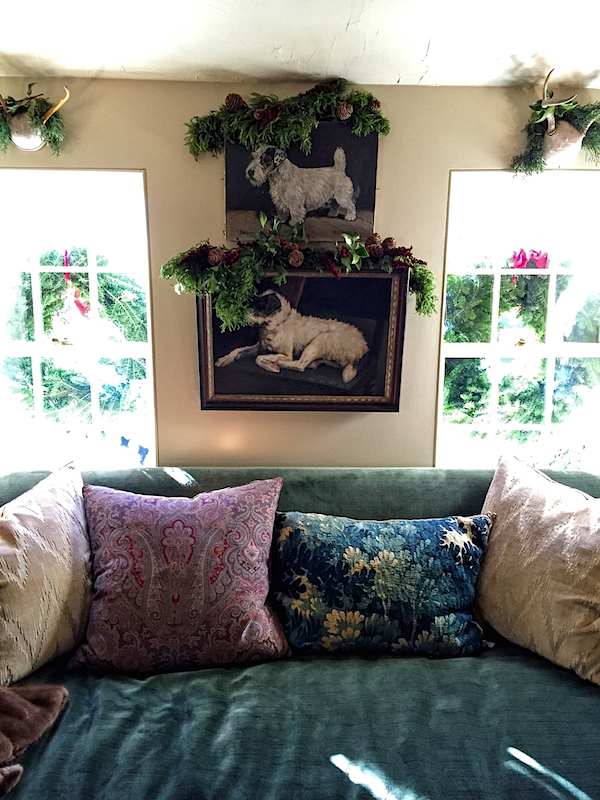 Magical and beautiful—know how much time, talent and love from Lisa to create this Holiday Wonderland. Beautiful! A very inspiring post. Thank you for sharing this lovely home. Lots of great inspiration here – I love the feathers and magnolia leaves – I will be saving these photos! Many thanks and merry Christmas, Stacey! This is one of the best Christmas posts of late on ANY blog! Thank you for such warm and beautiful images and to Lisa for allowing us for a peek in her house. This is absolute perfection! I loved every detail! Just what I needed to put me in the holiday spirit. What talent and love is shown in these rooms. So beautifully restored, the decor is magical! Those sconces are simply amazing and the home has much warmth and charm! Thank you Stacey! My favorite Christmas post ever. Absolutely stunning and the architecture is wonderful. Thanks for sharing and happy holidays! Is there any place to get this article?…was it in a magazine?…was going to print it all and all the pics…but would love to find the magazine with it in it…please let me know it’s SO beautiful!…thanks!…Sylvia Treadwell…..
No Sylvia – like most of the pieces here, I took all the photos and this is exclusive to the site. So glad you enjoyed. 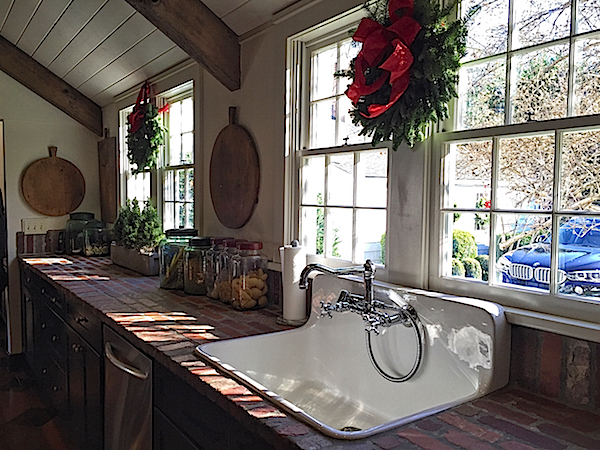 Thanks for sharing this Beautiful home decorated for Christmas! I love all the classic detailing. A stunning and thoughtful labor of love! I adore every aspect of Lisa’s house. Thank you for bringing us inside Stacey! One of my favorite houses Ever!! Thank you so much for this post- LOVE!!! Absolutely love this. Just the right amount of decorations to make it feel festive, but not over done. 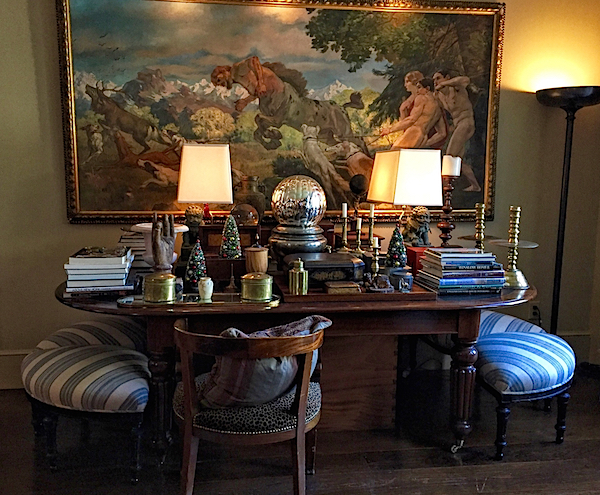 Lots of inspiration received by looking at these beautiful rooms. Thanks for sharing. Beautiful house. I love giant pinecone garland. 82 queries in 0.717 seconds.